A home remodeling project of any type can be a stressful—and emotional—experience, but kitchen remodels tend to be particularly dramatic for many homeowners. This may be partly because people tend to have a strong connection to their kitchen, since it plays an important role in family activities. 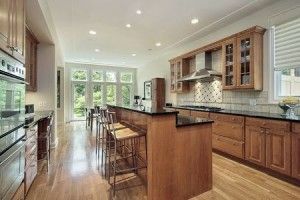 But they also can find themselves overwhelmed at all of the issues and considerations involved in this specific type of remodel, such as questions about how to best arrange the kitchen with regards to function and efficient operations. Then of course there are also the financial issues that go along with a kitchen remodel. While people obviously sometimes are disappointed if they end up spending more than they had expected, you might be surprised to learn that others sometimes regret spending too little on their new kitchen. As this article notes, in a recent survey, quite a few people who had just completed a kitchen remodel said in hindsight they wish they had spent a little more. Not that they were eager to spend all of their money, of course, but there were a few things they later realized they would have liked to include in their new kitchen. The respondents also said they wished their contractors would have communicated with them better during the process. This not only helps consumers feel more involved and informed, but it also helps them avoid (or at least prepare for) any unpleasant surprises. At RW Remodeling, we understand that this is a major step for your family, and we do everything in our power to eliminate the stress and worry from this experience. Contact us to discussion your Arizona kitchen remodeling project.